<!-- -----------ADD LISTING CONTENT CODE------------------>Bobcat 331, 334 Upper Drive Shaft / Sun Shaft For Travel Motor Final Drive PartsPRODUCT DESCRIPTIONWe Just Opened Our Ebay Store And Moved Our Products Here, So Hello Ebay Shoppers! Brand New Replacement Komatsu PC120-6E Final Drive Motor We Sell Wholesale To The General Public So Why Pay Retail Elsewhere? Sales Team is Available Mon-Sat 8am-8pm CST This is a brand new SUPER strong high quality replacement final drive motor at an unbeatable price. This motor comes standard as a 2 speed track motor, but if you have a single speed machine (with 3 hydraulic lines instead of 4) let us know and we will by-pass the 2 speed option. We know you are looking for the best price you can find--we are offering you a high quality replacement motor at the best price! If you think you found a better advertised price, please let us have a chance to beat it! You Are Buying From FinalDriveMotors. com Because: We buy direct and keep our overhead very low so that we can offer wholesale pricing to the publicOur trained staff has years of experience selling 100s of motorsOur sales team offers support both before and after the saleOur sales team is available by phone Monday- Saturday 8am - 8pm Central timeOur sales team is available 24/7 via email supportWe do not charge or require a core deposit (what a hassle that is for you)Super fast FREE Fed Ex ground and freight shipping within Cont. U.S.Limited Lifetime Warranty - First 2 years totally free replacement drive then prorated after 2 years for life details explained on our websiteWholesale pricing to the public, no gimmicks or up-sellsHonesty and integrity is our #1 goalGive us a chance to EARN your business today! 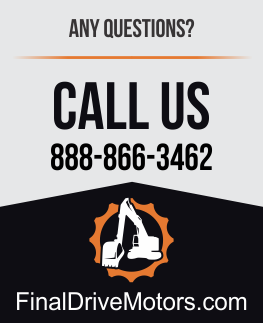 * If you arent 100% sure of which final drive fits your machines make and model, call us before you buy! There are different versions for different serial number sequences on some models.